Oberleutnant Hans Dortenmann downs Major Harry Downing of the 78th FG. 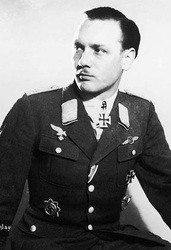 The top scoring pilot in the FW 190D was Oberleutnant Hans Dortenmann. The first Gruppe to convert to the "Dora" was III/JG 54 followed by JG 26. 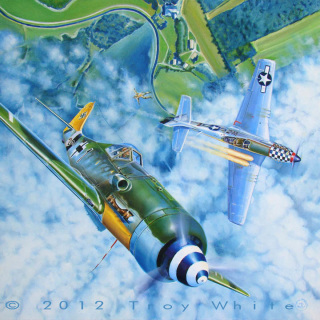 Dortenmann flew with both JG 54 and JG 26 and he is the subject of this painting. Hans received the third production Fw190D-9 (W.Nr. 210 003) and flew it until the end of the war. In 150 combat missions Hans scored 38 victories, 18 of them in the Dora. An aggressive pilot and always eager for combat, Dortenmann was also a good leader and cared for the welfare of his pilots. 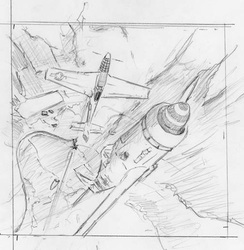 He had the entire vertical tail surface of his aircraft painted yellow so that his pilots could easily identify him. 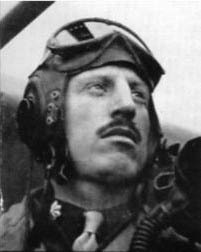 On 29 December 1944, while aloft with his staffel, he refused a suicidal order by control to descend to low altitude. His court martial was ordered but the following day he was named acting Gruppenkommandeur of III./JG 54. He held that position until 11 February. 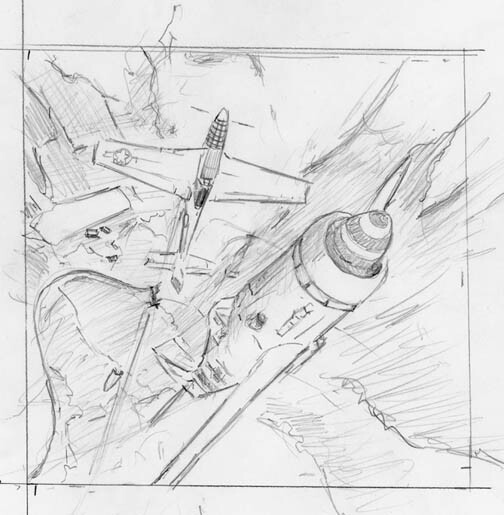 On 25 February, in the wake of heavy losses, III./JG 54 was absorbed into JG 26. Dortenmann’s unit 11./JG 54 was redesignated 14./JG 26. The Focke Wulf 190D is considered by most historians to be the best German piston engine fighter of WWII. The 190D or Dora as it was called utilized the Junkers Jumo inverted V12 engine. This engine coupled with the large paddle bladed prop gave the Focke Wulf a a maximum speed of 426mph (686 km/h) at 21,000 feet and was competitive with the best of the Allied fighters. It was armed with two 20mm MG151/20E cannons in the wings with 250 rounds each two 13mm MG131 machine guns in the nose with 475 rounds each. 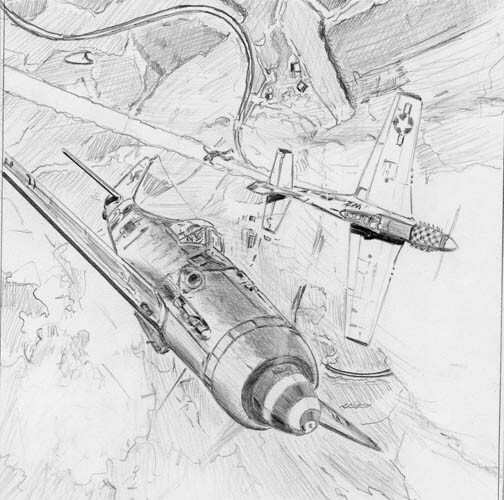 In the hands of a competent pilot like Hans Dortenmann the 190D could be more than a match for the P-51 Mustang. The scene depicted in “Dora Dazed” took place on 19 March 1945. The encounter between Dortenmann’s Doras and USAAF Mustangs of the 78th Fighter Group is well documented. On that date the 78th Fighter Group Was involved in a fight with Me 109’s of JG 27 as Dortenmann’s Staffel was returning from a patrol. 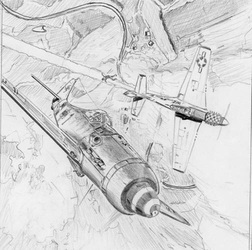 With an altitude advantage they surprised elements of the 84th Fighter Squadron who were concentrating on the 109’s. 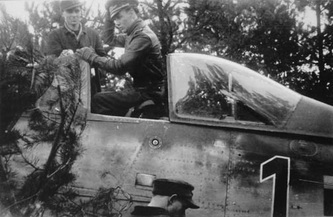 “Shampoo” Flight consisting of four Mustangs led by Major Harry Downing, CO of the 84th Fighter Squadron lost three planes with Downing falling to the guns of Oberleutnant Dortenmann. Downing however, did manage to bail out and spent the rest of the war as a guest of the German government. 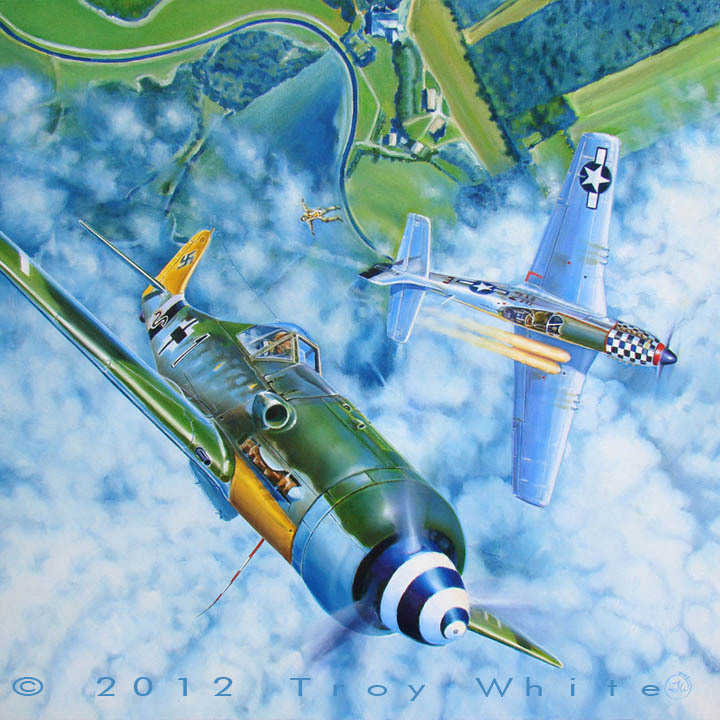 For my painting composition I chose to depict Major Downing exiting his stricken P-51 just prior to the right wing fuel tank fully igniting and causing the wing to shear off. 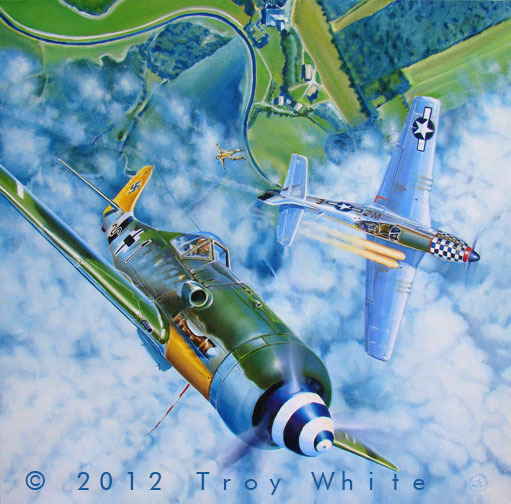 The 78th Fighter Group claimed 32 enemy fighters destroyed (6 FW 190’s and 24 Me109’s) against the loss of five P-51s. It was their most successful combat of the war. Actual German losses in this combat however were only four FW 190s and 14 destroyed or damaged Me109s. On 29 March 1945, Oberleutnant Dortenmann was appointed Staffelkapitän of 3./JG 26. On 17 April he shot down a Hawker Tempest SW of Lübeck for his 35th victory. Three days later he was awarded the Knight’s Cross on 20 April. It was the last major decoration bestowed upon a member of JG 26. As the Eastern and Western Fronts merged over the German capital JG 26 began to encounter Soviet aircraft. Dortenmann scored his final two victories of the war on 26 and 27 April. Both of his victims were Russian Yak-3 fighters. On 4 May 1945 Oberleutnant Dortenmann led I./ JG 26 on a fighter sweep to the Kiel Canal. 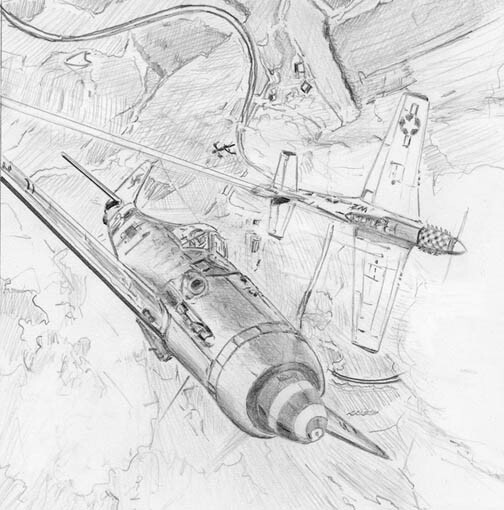 It was the last combat mission for JG 26. He destroyed his Dora in which had survived in combat since the previous autumn rather than let it fall into enemy hands. Hans was made a prisoner of the British but was soon released. After the war Dortenmann became an architect based in Heidelberg. He passed away in 1973.